Our customers choose us because we are an established local company offering a service backed by Gas Safe and OFTEC accreditation. We are Worcester approved installers, and accredited for Green Deal installations too. 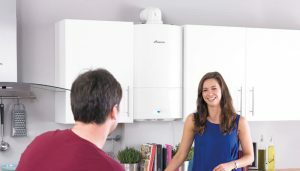 Choose Absolute for expertise in boiler installation, central heating systems including underfloor heating, boiler repair, oil and gas central heating, and all plumbing work. Our team of experienced and skilled technicians are here for customers across the community. We welcome jobs from homeowners and companies alike, and have a great track record in delivering jobs of all size and scope. From a leaking pipe or a boiler on the blink, to an ongoing installation or maintenance contract, we are confident we can meet or exceed your expectations. We value the skills our technicians and engineers bring to the team, and it is this breadth of expertise that allows us to deliver projects across a wide range of gas, plumbing, and heating disciplines. Whether you need a plumber to install a dishwasher or a central heating specialist to service your oil system, you can be sure we will deliver on service standards and price. At Absolute we know that good customer service counts right from the start, so if you have need further information we will always be happy to help. We will provide a free, no obligation estimate for your job, and will undertake a site visit for assessment where necessary.